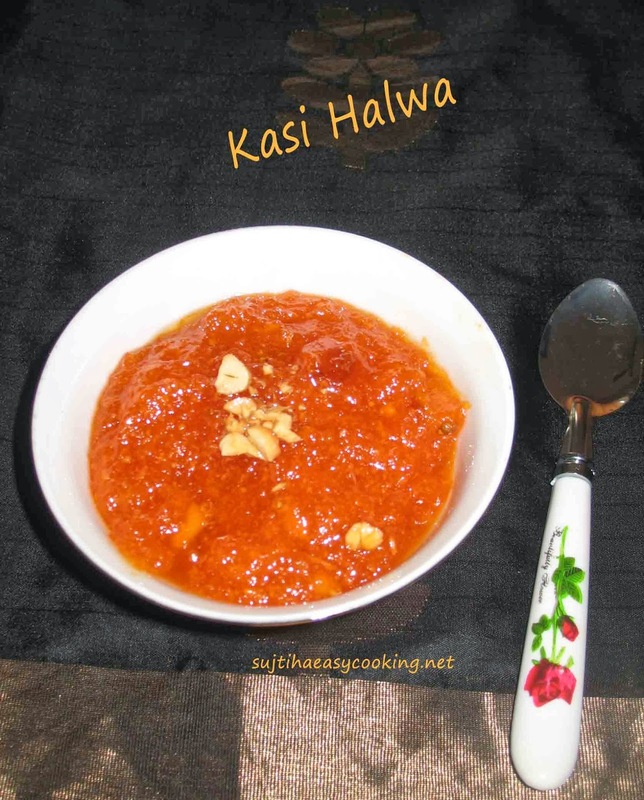 Kasi Halwa/Poosanikai Halwa/White Pumpkin halwa.. dont know why this is named as kasi halwa…. if any one have idea about this please let me know…. one of the most delicious halwa ever i prepared… such an easy instant version…. Two versions are there with milk and with out milk… i agree milk gives the rich taste to sweets so did this with milk version…. also food color is purely your choice if you dont want the artificial color skip it…. * Discard the seed and peel out the green part of pumpkin..
* Heat the kadai with 1 tsp of ghee and fry the grated pumpkin..
* After few mins the pumpkin color will get change.. add the pumpkin juice that you take out in grating time..
* Add in the Sugar, color, Cardamom powder..
* Give them a good mix and in the mean while add some dollop of ghee to halwa..
* Here you’ll see the water gets dries up quickly ..
* In a separate pan heat the ghee and fry the cashews..
* Garnish them over to the Halwa..
* Adding milk also optional … can be prepared without milk too…. these make some rich taste to halwa.. Delicious Halwa Suchi, made very nicely….